Ghajini, director A. R. Murugadoss’s Hindi version of the Hollywood thriller, Memento, might’ve been more successful had it borrowed even more heavily from the original film that it already does. Ghajini‘s premise is so similar to Memento‘s that Murugadoss included a note at the opening of the film: “We acknowledge other stories that have dealt with this issue.” They needed to; the premise is almost identical. The film’s protagonist, Sanjay (Aamir Khan), lost his ability to form new short-term memories after a fight with some goons who killed his fiancee, Kalpana. Now he wants to avenge her death. Murugadoss didn’t just appropriate the plot. He also copied Memento‘s signature gimmicks, including the protagonist’s use of Post-It Notes, Polaroid photos and tattoos to act as his memory, as he learns more about Kalpana’s murderer. Unlike Memento, where neither the protagonist nor the audience learns the identity of the murderer until the end of the movie, the identity of Kalpana’s killer is revealed in the first twenty minutes. He’s the film’s title character, Ghajini. So there’s no mystery about who killed Kalpana. The only questions are why he killed her (turns out it’s over something stupid and unrelated to the main plot) and how will Sanjay inevitably kill him. Fortunately for Sanjay, the loss of his short-term memory apparently imbued him with superhuman strength. Khan spends most of the present-day sequences staring wide-eyed at the camera, before roaring and stomping about, Incredible Hulk style. Though he was a career businessman before his head trauma, he now can pummel henchman by the dozen. At one point, Sanjay punches a villain so hard that the guy’s head turns completely backwards on his body. Perhaps the most awkward aspect of Ghajini is its flashbacks to the early days of Sanjay’s romance with Kalpana. The longest flashback sequence makes up the middle hour of the film and is, on its own, a typical yet entertaining Bollywood romantic comedy about mistaken identities. Asin Thottumkal is engaging as Kalpana, a role she originated in the 2005 Tamil language version of Ghajini. But the light-hearted flashback scenes feel totally inappropriate sandwiched between the humorless, ultra-violent action sequences of the present-day storyline. 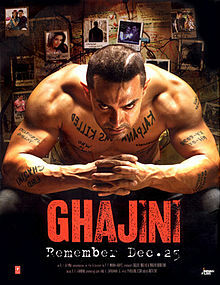 There are actually some things that Ghajini does well. The chemistry between the lead couple during the flashbacks is terrific. The cinematography and fight choreography are excellent, and the film features some beautiful songs by A. R. Rahman. But the choppy story structure makes the film’s three-hour run time feel even longer, and it’s riddled with logical errors that Murugadoss should’ve corrected when making Ghajini for the second time. A film as good as Memento deserves a better remake than this. This entry was posted in Reviews and tagged 1 Star, 2008, A. R. Murugadoss, A. R. Rahman, Aamir Khan, Asin Thottumkal, Bollywood, Ghajini, Memento on January 1, 2009 by Kathy.